Jy – used in Asia. It means “I support you!” or “I hope you do great!”. It is an abbreviation of “Jia You”. He certainly does support me! Thanks Jy. The next time he stepped forward, it was to write with me on a big topic – reincarnation – giving spirit’s perspective on the subject. This is Jy. As you know well, I am always here, ready to listen and to advise and to aid you, particularly around matters of writing. Why then have I stepped forward tonight? Am I the expert on reincarnation? This is puzzling, no? No – it is simple. I am here as an interpreter, for there is much written about the subject of reincarnation in your world, is there not? Volumes and volumes of it, all purporting one thing or another, exploring what happens when you die, the choices you make or those made for you. Theories abound on the purpose for a between life time, when the soul may sit and ponder upon its actions in the last life…or alternatively when that soul is judged by beings greater than itself and held to account for its deeds, good or bad, in the last life. Dependent upon which version you read or believe, upon which holds most sway in your heart and mind, you might consider each new life a reward or a punishment. The truth is, it is neither of these things. You have free will. Without it, there would be no purpose to incarnating at all. And given that that free will applies at all times – when incarnated and when in spirit – how you choose to use your time between lives is as much your choice as how you choose to spend your time on earth. Some souls do spend time resting, thinking of and doing nothing, while they recuperate from the stresses or even traumas of their last earthly life. Some throw themselves straight into the fray of reviewing that life, with the counsel of a wise teacher and mentor who can help them articulate what they have learned, what they failed to learn and what they wish to do next. Most opt for another life and the choice of learning further lessons. Some choose eternal rest. But it is always personal choice, taken of free will. Guidance is just that – guidance, not coercion and certainly not instruction. Thus as each soul comes to an earthly life again, as it takes its first breath, it is in the body and the situation that the soul has agreed it would be. Those who most intimately surround it are part of that same negotiation – they have agreed to be part of the lesson – and in so doing are also learning themselves. Your souls have contracts with each other that you are compelled to carry out – sometimes to the puzzlement and even frustration of the conscious mind, the human personality. This dichotomy is what gives rise to questions such as “why am I still with him/her?” “Why do I feel the way I do – he/she’s not my type?” “He/she irritates me and yet I love him so much. Why is that?” When your souls draw up the contracts, you are drawn together. That is the mechanics, the process of reincarnation. But what is its purpose? Its purpose is to satisfy your hunger, your curiosity. The soul is an eternally curious creature. It seeks to learn always, to grow, to change, to explore all there is to explore, to be all there is to be and thus eventually to arrive at a place where, in the completest of knowledge, it can make the proclamation: ‘here – this is what and who I am!’ That moment is reached by relatively few beings and those who do reach it rapidly realise that the journey is far more enjoyable than the destination. Not that Nirvana is unpleasant – on the contrary it is far too peaceful and serene to be anything other than relentlessly pleasant. But the soul which has had many an adventure while incarnated will often yearn again for the adventure. And then we teach; we guide; we mentor. Reincarnation is the next chapter, the next adventure, the next experiment. It expands your souls, your consciousness. It enables you to see and to experience the world through your neighbour’s, or friend’s, or enemy’s eyes by becoming, in essence, that other person. Reincarnation is the step by step, systematic unfolding of the soul’s journey from the bliss of ignorance to the ecstasy of enlightenment. But do not hurry toward the end of your journey. Firstly, because it is very far away. But secondly, and more importantly, because you miss so much by rushing through life. There is always so much more to see, feel, smell, hear, than you are aware of in any and each moment. One day, when you review your time on earth in this particular incarnation, you will realise that the joy you felt from the breeze in your hair, the beauty of a drop of dew on a leaf – that these things were as important and enriching as the most tangible of human attainments – the new job, the big win, the pay rise or the night out. Sometimes the memory of a smile will light your days for years and years and the love of laughter may be carried over into the next life. Such is the impression seemingly small incidents make. So, savour every moment of this incarnation, however strange, or sad or sweet. Savour each moment, savour each encounter with another. Remember. 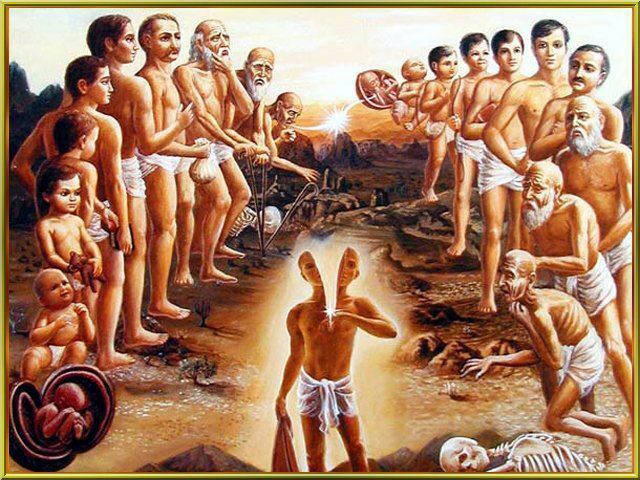 Reincarnation is a journey for the soul, the mind, the body and the spirit. Each will perceive it quite differently and respond to it differently but the whole will be enriched by the experience. Do not seek to control the process. Only your soul can have that say, between lives. Trust not the man who claims to have the ‘definitive version’ of the reincarnatory experience – unless he is dead and speaking to you as your guide, from spirit. Anyone still in earthly incarnation can only put forth an opinion on what reincarnation is and does. The only definitive knowledge comes from death itself. And no-one is born into their next life with all their soul memory accessible. Some echoes may remain, to guide and sometimes to puzzle you. Certain elements may be recalled at a later date, perhaps during spiritual work. But essentially each life is lived afresh. Afresh and awash with new possibilities, new adventure. Sally forth, my friends, on this your finest adventure. For the life you live now, in this moment, is always the finest. There is no better time than right now. When memories of previous lives surface, acknowledge them, examine why they have arisen at this time. They will be there to assist you in your present life in some way. There is no other reason to remember consciously. And having examined and concluded the purpose of the memory, move on. Do not dwell in the past – especially in the past life. For you are here to live the life you have now, to be the best version of the person you are now. Do not dwell in the past and do not hanker too much for the future. Let the adventure unfold as it will. We all live many lives in many places. But the only one you need to concern yourself overly with is the you you are right now. This entry was posted in Written with spirit and tagged inspired writing, Jy, reincarnation, soul, spirit guides on August 2, 2014 by louisebwylie.